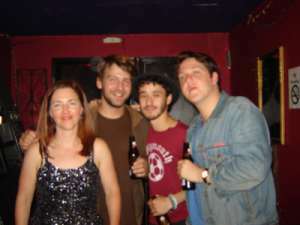 Three-quarters of the Postelles (pictured right with their, err, temporary replacement drummer) – Daniel Balk (lead vocals / guitar), David Dargahi (lead guitar) and John Speyer (bass) – had a nice chat with me before they played an awesome show for very vocal, devoted fans at DC9 on 18th September. We talk music festivals, Sane Lowe and what it was like recording their debut album. This is probably the silliest, most fun interview I’ve had yet. Many thanks to Sam and Mikey for helping sort this. How about you guys introduce yourselves and tell me what you play in the Postelles. John: I’m John and I play bass. Daniel: I’m Daniel and I sing. David: I’m David and I play guitar. 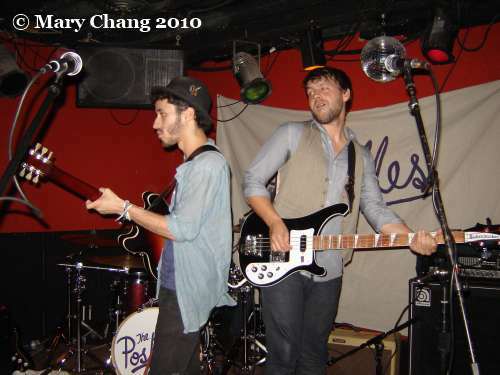 Daniel: [softly, pointing to Billy Cadden, their drummer] And I’m Billy, and I play drums. I’ve read a couple stories about how you guys got together. Why don’t you tell me what happened, in your own words. How it all happened, how the magic happened. Daniel: …and so he got me better grades, but I’m so bad that I brought him down. [David laughs] So David was his tutor. And we both brought him down. So we had to join a band because we all failed out. Daniel: No choice. Rock ‘n’ roll was the only way out. Daniel: I’ve always been interested in music, but it was only when I met them [points to David and John] that I wanted to be in a band. Says Daniel, the singer. Daniel: It is, isn’t it? John: But it’s actually true though. I also was always into music and met Daniel in a closet. And stayed there. Daniel: [to John] I’m out, ok? I’m out! You’re still in the closet! [looks at David, seriously] What about you? David: Um… [chuckles] I’m in between the closets…there two different closets! David: I think I always wanted to be in a band until I met Daniel. Then it was too late! Daniel: But once you get to a certain age, you have to jump in. John: You have no choice. When you’re 16.
Who were your favourite bands growing up, that you latched onto? Daniel: Rolling Stones. A lot of people don’t understand them, but I think they’re great. John: I think we’ve always been influenced by music of the ’50s. Daniel: And the ’50s, we were too young. John: Lots of great bands in the ’70s. Daniel: I like the ’70s. I like the ’80s too. Like the Cure. John: [laughs] This is the like the worst answer we’ve ever had! Daniel: No no no, we’ll name one band each…[looks at David] I like…you like who? They got back together and are going on tour again next year. Did you get to see them this summer at a festival? Yeah, they played Electric Picnic, in Ireland. Uh…I don’t think so. He didn’t tour with them? Daniel: You’re not thinking of Flock of Seagulls…? John: Were they the band you were going to name? Trust me, I know my Roxy Music. I’m a Duranie. Daniel: Naw, I love macaroni and cheese. [everyone laughs] John’s a seagull. John: [points to Mikey, their manager] Mikey’s the flock. Daniel: Seriously though, I like Roxy Music. And I like the Ramones too. So how did you come up with the name ‘the Postelles’? And not the Postal Service. John: But that was the original name! And someone else took it. Daniel: In high school, I was trying to spell ‘Postal Service’. But I can’t spell, so I spelt ‘Postelles’ and we just ran with it from there. Daniel: It’s a Motown thing. I couldn’t pronounce ‘Motown’. John: But you just did! Daniel: But I couldn’t in the past. Daniel: Is that a band name? David: Young is the Night. Daniel: ‘The Night is Young’? Are you guys going to change names by the end of the night? I think that’s already taken. Daniel: Yeah, by the Wonders. Uh, no, I don’t think so? I’m not a movie person. Daniel: Really? You guys are meant to be! I know all this random music trivia from the last 60 years. Daniel: You guys can watch movies together. So you guys watch a lot of movies when you’re on tour? Is that…? Daniel: No. We play ‘the movie game’. John: Do you know ‘the movie game’? No, what is it? Is it on DVD? Daniel: We can keep talking about ‘the movie game’ all night. Did you guys play that when you were over in Britain? Did it get really boring driving around? John: In Britain, the drives are short, which is great. David: In America, you play hangman, tic-tac-toe…Dan’s the champ. John: [mock aggravation] I can’t ever beat him in tic-tac-toe! So annoying! Daniel: I’m really good at tic-tac-toe. David: [to John] That’s because you don’t understand the rules yet. Daniel: Yeah, you just have to get used to it. So talking about touring in the UK…you guys opened for Futureheads in May. What was that like? Daniel: That was great. They’re a really cool band. Was that your first time in Britain? Daniel: We’d been there before, but that was our first tour. They’re a great band, they’re great guys, just a lot of fun. And it was really rainy, obviously. We played a lot of tic-tac-toe. John: The beer was good. Daniel: The beer was great. But the friends were better! And then you played a headlining gig at London’s Koko. Daniel: Yeah. That was a beautiful venue. It was really big. We were a little, uh, nervous when we walked in. But we were excited it was fun. John: Hard to find the stage. The dressing room was in the attic. David: Four stories. Our dressing room was four stories up. So we had to climb. John: I had to carry him. Daniel: I would not let you touch me before a show! [punches John in the shoulder] Don’t touch me before the show! Daniel: Yeah, the friends were better. What did you think of the reception by the British audiences, how your music went over in the UK? Daniel: Well, it depends on where we played. When we played Camden Crawl and Koko, it was great. Some of the Futureheads shows…people were listening, everyone listens to the music. But they’re not necessarily the loudest crowds, because they’re listening and not being drunk and messy. Sometimes in the U.S. they’re a little louder, and that’s fine. It goes both ways though. John: They’re more respectful. But when they know you and love you, they go insane. David: Once you get over the language barrier. Daniel: Problem is, we don’t speak ‘English’. We speak (in a Southern accent) “Ameri-cane”, so it was sorta tough. Did you get to meet him when you were over there? Daniel: No no, we didn’t. David: He works in mysterious ways. Daniel: He played our song ‘White Night’, but an old version. I don’t know if he’s played it since, but if he’s a big fan, that’d be great. We don’t know him in person. I like…he has good taste. Obviously! Oh, I was just wondering if you’d met them. Oh sorry. No no, I meant Radio1. David: No, we haven’t been to Radio1. Daniel: That would be great. John: If they want to book us, we’re available. Daniel: Do you want to book us on Radio1? John: How was Biffy Clyro? You said you here for that, right? Yeah, that was on Wednesday. That was Biffy Clyro’s first ever headlining gig in America. John: I don’t believe it, they play for huge crowds in the UK. Yeah, they consistently sell out Wembley. Daniel: What kind of music do you like? I need something with a good melody. I need something more substantial. John: We’re all about melody. Daniel: [looks at David and John] She’s gonna like us! Which is why I like you guys! Daniel: Did you like it? Daniel: Shower the compliments on. What I usually end up doing is listening to a song for about thirty seconds or a minute to get the vibe, because I can usually tell if I’m going to love it or hate it. David: Most of our songs are under a minute, so we’re good. Daniel:…so you can hate ’em under a minute. So I first listened to ‘White Night’ and ‘Sleep on the Dance Floor’, both of which were on the (‘White Night’) EP. What I really really liked about your sound was that everything was so well done. The guitars, the drums, the vocals just came together so well. To me, it seems like you guys are drawing on the great guitar groups of the ’50s and ’60s. Really good guitar riffs, awesome vocals. And the lyrical pop timelessness of the Beatles, one of my favourite bands from way back. And sort of what we call the British Invasion. Do you agree with that? Daniel: Like you said, that was definitely a big influence. John: But I don’t think we ever decided to sound like that. It was just what we sounded like. It wasn’t that conscious. We weren’t like, “let’s make a project that sounds like the Kinks”. It wasn’t like that at all. But then when we got together and started playing, that’s what music we were into. The records we had stolen from our parents. Daniel: That’s why they kicked us out of the house. Did you ever return the records? Daniel: We sold them all on eBay. John: To pay for gas to get here. Daniel: Yeah, half of it was. Daniel: He saw us play at a club in New York. Then we became friends and we sent him a demo of ‘123 Stop’ and he wanted to do the whole record. So yeah, that’s it. That’s what happened. What was it like taking the songs from the writing step into the recording studio? Daniel: We record live, and we were really well-prepared – we knew the songs really well. It was pretty easy for us to put them down. John: Well, it was all about us recreating that live feeling in the studio, that’s what we try to do. John: Yeah, it was weird! (Before we started the interview, I explained that I had just taken up bass 2 months ago and they ran with it.) Not knowing anything. I mostly hummed the bass parts. Daniel: [mimics bass line] That’s from one of our new songs. You heard it here first! Are you going to play any new songs tonight? Daniel: One of them is called ‘New Song parentheses New Song parentheses’. Or what’s the singular for ‘parentheses’. Well, that was a good of a time as any to break this interview in half. Check back tomorrow when we’ll have part 2.